Attitudes to cycling gloves vary. While largely worn for comfort and grip, protection is a very real issue as well, from UV rays but also from falls. In fact, a lot of riders say they feel naked without them, especially if they’ve come off their bike in the past. The instinctive “in-danger” fall is done hands-out; so think – would you rather slide along the bitumen with or without a layer there? We use our hands for almost everything we do, so they are worth protecting. He says any Velcro tab should really only close the back of the glove rather than be essential to hold it on. The palm material may be leather or a leather substitute, but should be sturdy enough to be long lasting and also give protection. Improvements in grip will also centre on the palm area. Look for some padding positioned at the main pressure points where a rider will typically rest their weight on the handlebars. “The key feature is the padding,” says Roche, “especially around the nerve points.” But he says to keep in mind whether the location of the padding positions your hands well on the bar, or if they seem too bulky. If it doesn’t feel right, try another glove. 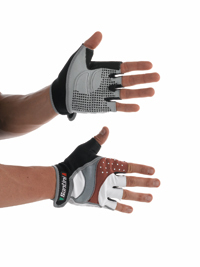 Padding is very important to cushion against vibration and road shocks to the susceptible areas of your hands, as cycling can place a good deal of stress on the nerves there (numbness or pins-and-needles is not an uncommon experience after long rides). A lot of gloves will have a panel of towelling type material, which can be handy for drying glasses or forehead (or nose, so the glove should be washable), and another handy idea for some are loops sewn between fingers, designed to hook opposing fingers into to ease off each glove. The short fingered version (mitts) will be more popular in the warmer months ahead, but if looking at long fingered gloves make sure you try them while gripping handlebars to make sure the fingers are not too short for your hand (or the resulting pressure will be uncomfortable). Roche says the importance of other features very much depends on individual priorities – things like higher sun protection, matching your bike’s colour, or removal aids. He says with the huge range of gloves on offer, finding the ideal pair for your particular riding needs shouldn’t be a problem. The following gloves are only a smattering of the range on offer, but feature qualities that riders will want to keep in mind. This Australian company is making a range of changes to this summer’s clothing line (including folding the Cinettica brand into its Netti Elite range) but is keeping its summer mitts consistent (if you’re on a good thing…). Skill Glove (RRP $29.95). A padded palm glove with a good Velcro closure, it features large mesh on the back for full airflow and a usefully visible reflective N. Range of colours and sizes, including children’s. One pick is flouro yellow which, with that large reflective element, improves rider visibility particularly from side angles and for signalling (popular with commuters and parents). Dense gel/foam padded palm provides good padding. Performer ($39.95). Coupling sharp design, Velcro closure, mesh back and a dense gel/foam higher level padding. While not broadly known in Australia, California-based Serfas has been making bike clothing and accessories for 15 years. Zen ($29.95). Entry level glove, it includes partitioned padding on key points to provide vibration dampening and spread the pressure while maintaining flexibility, stretchable mesh on the back, towelling face wipe on the thumb, reflective trim and discrete non-slip circles on the fingers. Rather unusually Serfas put their Velcro closures on the inside of the wrist. RX ($44.95). The next step up, this includes gel pads and “easy-off” loops (not shown in the picture). BBB is a large Dutch-based cycling supplier well known for accessories and clothing – less well known is that BBB is also a sponsor and supplier of European pro teams. Racer ($29.95). 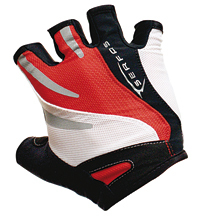 A nicely styled lighter weight racing style glove, with breathable stretch top, Velcro closure (again unusually on the underside), and finger loops. Roeckl is a German family company that specialises in sporting gloves, making a range of cycling gloves with a number of innovative features. 207 Illertissen (men’s, $79.95). Generous amounts of high quality gel pillows and foam pads on the palm and unusually around the thumb and forefinger joint to reduce vibration, pressure on nerves and improve hand position. Reflective piping, high grip silicone treatment on palms, very soft towelling glasses wipe. Innovative “pouches” on the palm allow glove to be taken off without having loops between the fingers. 056 Danis (women’s, $89.95). Another premium glove with many of the same features as the men’s 207, this is cut and styled for women’s hands. Sugoi is a Canadian-based sportswear company started by a group of extreme sportsmen and women. Now owned by Cannondale and a sponsor and supplier of a European pro team. RS Glove ($44.95). Designed for long ride comfort, including padding to protect nerves and dampen vibration, textured mesh back and vents on the hardwearing synthetic leather palm. Velcro closures, towelling thumb cover. Evolution ($47.95). Many of the same features as the RS but in a pull-on style (no Velcro tabs). Most cycle riders and those who have watched the Tour de France know Italian premium bicycle clothing company Santini, a major sponsor and provider of pro teams, the UCI Road World Championships, the Australian national team, and Australia’s new GreenEDGE pro team. Despite its traditional cycling history it is often quite innovative in its use of material and styles. 367 Gel Pro ($74.95). This retro styled racing glove is sure to please the fixie, steel frame or wool jersey fans in our midst. Coupling new technologies in a lighter weight format this includes mesh inserts for breathability, reflective piping, anti-slide palm coating and critically placed gel padding. 367 Gel Blend ($74.95). A more contemporary styled glove available in race and non-race formats, these include the mesh breathability, anti-slip grip and reflective piping. The lighter race version comes in a pull on style in.